The former Washington Husky tight end (and defensive end) led his new team with 105 receiving yards in an impressive NFL debut. 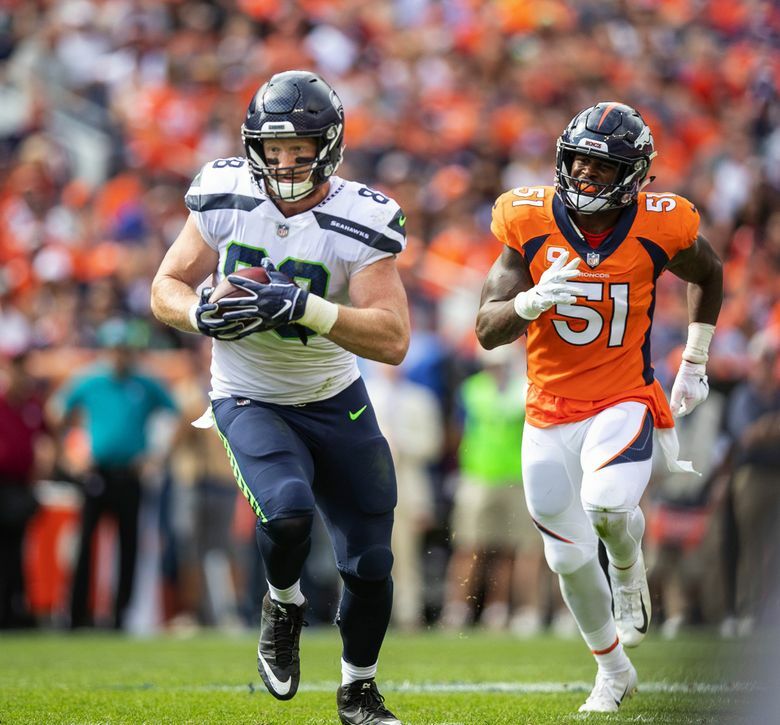 DENVER — Will Dissly said the word “cool” 19 times in seven minutes. If you’re keeping a “cool count” at home, that’s 2.7 cools per minute over the course of Sunday’s post-game interview. And yet, can you blame him? It was redundant, and it was true. What better way to describe a former Pac-12 defensive end scoring the Seahawks’ first touchdown of the 2018 season? Or the fact that the 22-year-old from Bozeman, Mont., led his team with 105 receiving yards in his NFL debut? Or that he effectively incinerated his national reputation as a one-dimensional “blocking tight end”? Don’t get him wrong, Dissly is a bruising blocker. But that’s not all the rumbling rookie can do. “I think that’s how tight ends should be. You should be able to block and catch a pass,” Dissly said. “It’s not hard. They throw to you, you catch it and then you go do some cool things. In that case, Dissly had more fun than some outsiders probably expected. To the Seahawks, though, Sunday’s outburst was not surprising. It was not only cool, but worthy of comparison. Ditka or Dissly, it makes little difference. In a 27-24 defeat at Denver on Sunday, the 6-foot-4, 265-pound tight end — who recorded 25 catches for 336 yards and three touchdowns in his final two seasons at Washington — did his job. That included leaking off the line of scrimmage and bounding into the end zone for a 15-yard first quarter touchdown. It also included seeing running back Chris Carson hurdle a human being, and then deciding to raise the bar. “He hurdled a guy and then I told him I had to one-up him with the big catch,” Dissly said with a grin. That meant catching a crossing route between two Broncos, shrugging off safety Justin Simmons, veering left, stopping as suddenly as a 265-pound armored tank possibly can, watching safety Will Parks fly by and then diving just short of the pylon. It was a 66-yard ride, but Dissly wasn’t satisfied. In all, the Washington Husky alum — who flipped from defensive end to tight end after UW coach Chris Petersen saw him catch a pass during a bowl practice in 2015 — finished with three catches for 105 yards and a touchdown. The former high school tight end, defensive end, shot put and discus thrower capably replaced presumed starter Ed Dickson, who sat the entire preseason and remains on the Non-Football Injury list. Of course, even away from the cameras, he’s been doing that all along. “He’s been great all training camp and he’s been great all OTAs,” said quarterback Russell Wilson. “He’s been a rock star for us. He’s been rock solid. He’s been able to step into the role of playing tight end and making plays. He’s very fundamental and he’s very smart and gets the game. Without standout wide receiver Doug Baldwin, who left Sunday’s game with a sprained MCL, more complete performances will likely be needed from Dissly (and everyone else) moving forward. More big blocks. More red-zone catches. More physical runs. “I was just excited,” Dissly said. “I have a lot of family here to support me. Guys put me in a cool opportunity to raise my platform. Really just with the confidence with these guys, there’s so much leadership that I can just lean on them and just go and execute my assignment. It’s really easy.